Only very limited original pricing information is available for Hellschreibers and associated equipment. If you have any additional pricing information, please contact me. Note: the provided conversions from historic prices to post year-2010 equivalent prices, are estimates by me, based on historic statistics on general inflation ("buying power") and exchange rates. Inflation for specific industrial products such as telecommunications equipment, does not necessarily track that general "consumer price index" inflation. For prices quoted by Siemens to the Swedish Air Force in 1941, and book value of the Swedish Army in 1944: see further below. In 1948 (i.e., post-WW2), Siemens in The Netherlands quoted a price of DFL 4295 to the Dutch news agency ANP (ref. 20B) for a Feld-Hellschreiber machine (including taxes, import duties, and shipment; import from Siemens/Sweden). In 2015 money, I have estimated this to be equivalent to 19308 Euros (US$ 21688), based on historic general inflation and exchange rate data. 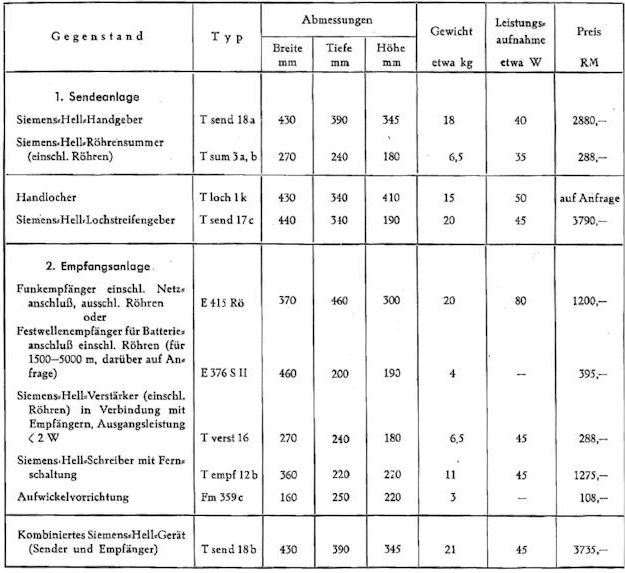 The table below shows the official 1937 price list from Siemens-Halske for civil "Presse-Hell" related Hellschreiber equipment. According to the table above, the 1937 Hellschreiber model T empf 12b listed for a price of 1275 Reichsmark (RM). In 1935, Siemens-Halske proposed a 1933 model T empf 12a to the London Metropolitan Police for ₤100, and a punch-tape sender for ₤250-300. Ref. 36. To put these pound-sterling prices in perspective: in 1946, the average salary in the British "metalworking, engineering and shipbuilding" industry was ₤22.40 per month (US$98.56 in 1946), ref. 35. From March 1940 on, the national German news agency (DNB) had the exclusive right to sell the Siemens-Halske "Presse Hell" machines. Per ref. 25, the 1940 price charged by DNB for such a printer was only 875 Reichsmark...The Volksempfänger ("People's Receiver") model VE 301 initially (1933) cost 76 RM, reduced to 65 RM in 1938. The "301" designator refers to 30 January 1933, the date on which A. Hitler was named chancellor of Germany. The set was built by about 40 manufacturers in Germany, Austria, and occupied Poland (ref. 29) - about 1.5 million in 1933/34 alone. Around 1938, the "people's television set" (Einheits-Fernseh-Empfänger E1) was to be sold for 650 RM. 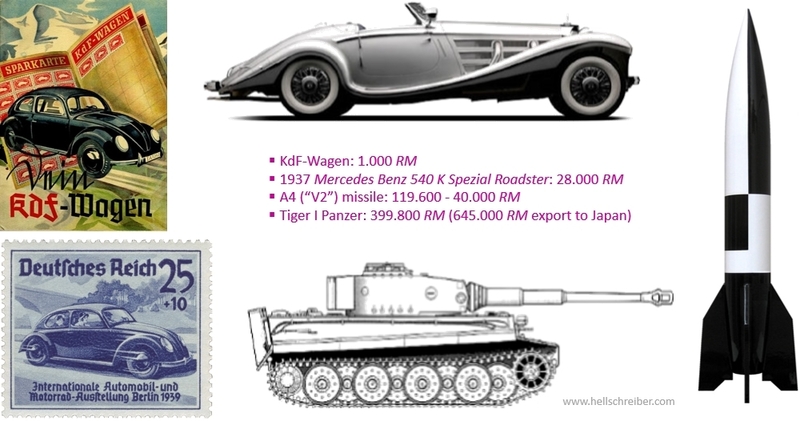 To put the 1937 Siemens prices in perspective: let's compare it to the price of the KdF-Wagen, the progenitor of the ubiquitous VW "Käfer" ("beetle"). This car, designed by Ferdinand Porsche (based on the complete designs "borrowed" from Josef Ganz, a jewish automobile journalist and designer, ref. 2), sold for under 1000 RM around that time. That represented 35 weeks of gross wages for an average factory worker. In 2015, the average price of a new car in Germany was 30750 Euros, whereas the average annual income was 32643 Euros. Ref. 30. The average monthly pay for a young "party" bureaucrat was about twice as high, and big-city teachers made something half way between the two. At Radio Mende, white-collar employees received an average monthly salary of 384 RM (169 RM for women), and managers received an average 1197 RM per month. Ref. 3. The salary of apprentices ranged from 20 RM/month (first year) to 54 RM after four years. During the war, the standard 48-hour work week was increased to 60 hours (56 for women). Standard vacation varied between 6 and 18 days a year, based on age and seniority. Ref. 4. Wages for non-German workers, such as prisoners of war and east-European civilians, were up to 75% lower and varied with age, gender, and productivity (ref. 6). 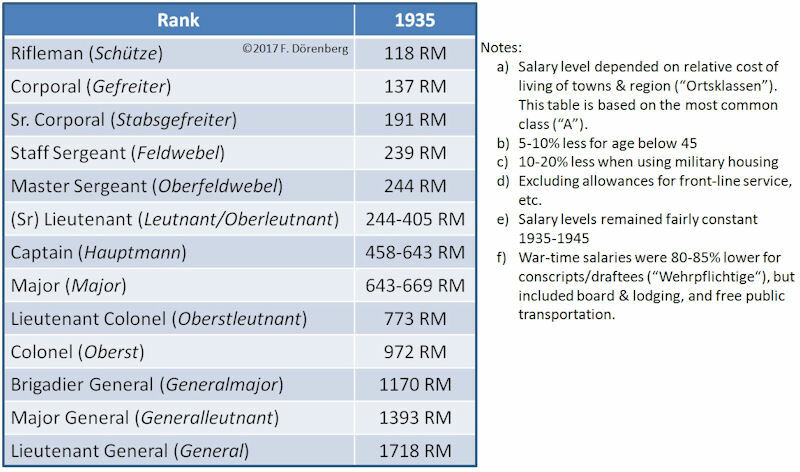 During the WW2 years, the salary levels in Germany were relatively flat, whereas in the UK and USA, they increased sharply (see Charts 33-34 in ref. 40). Examples of wages in the aviation industry are given in ref. 41. For the more fortunate, the 1937 Mercedes-Benz 540K Spezial Roadster could be had for a mere 28000 Reichsmark. That is, the price of 28 KdF cars. Officially, the KdF cars were sold via the Kraft durch Freude ("Strength through Joy") savings program, but none was ever delivered to the 350 thousand paying participants. Only several hundred were ever manufactured. They were delivered to high-ranking military and party officials... The basic no-frills version of the famous Tiger I tank listed for 250800 RM (ref. 39). For reference: the average ( = mean) annual gross salary in Germany was around 41000 Euros in 2015 (3400 Euros/month; source: Statistisches Bundesamt). In the USA, the 2015 factory workers had an average hourly rate of $11.65, and a median annual salary of $41254 (source: payscale.com). Siemens teleprinter model T37: I still need original pricing of this model. This model was built 1931-1945. Siemens teleprinter model T37: I still need original pricing of this model. This model was built 1933-1960. Siemens teleprinter model T68: I still need original pricing of this model. This model was built 1951-1960. 1970 Siemens teleprinter model T100: ≈10000 Deutsche Mark (DM, ca. €17000 in 2014), about 6 months wages of a reasonably well paid worker. This model was built 1958 - ca. 1980. 1980 Siemens teleprinter model T100: ≈11000 DM (ca. €11500 in 2014). 1979 Siemens teleprinter model T1000: 12620 DM (ca. €14000 in 2014); this model was built 1976 - 1985. Sources for the above teleprinter and Volkswagen prices: ref. 8. Source for the DM to Euro inflation and conversion data: ref. 9. Early 2015, I located archived correspondence between Siemens, the Dutch news agency ANP, and Swiss company EMA (manufacturer of instruments and teleprinters), in the National Archives of The Netherlands in The Hague. I visited the Archives in August of 2015, and copied about 75 documents. A number of them include price quotations and invoices (ref. 20A-21J), including taxes, import duties (12-30%! ), and shipment. I have summarized this is the table below. I have added my estimates of what the equivalent prices would be in today's money (2015), based on historic statistics on general inflation ("buying power") and exchange rates. Note that inflation for specific industrial products such as telecommunications equipment, does not necessarily track that general "consumer price index" inflation. The table above list a price of DFL 0.37 for a roll of paper tape. This is corroborated by ref. 171d from late 1948, which mentions that the ANP news agency paid it regular supplier in Rotterdam DFL 37.00 per 100 rolls, but that the Dutch publishing company AP in Amsterdam had a local supplier who only charged about half as much (DFL 19.48). As a reference, in 1950, the average gross annual income in The Netherlands was DFL 3030, and an average car cost DFL 5000 (only 1 in 75 people owned a car). Ref. 21A, 21B. Source for historic DFL to Euro conversion data: Internationaal instituut voor sociale geschiedenis. Source historic Euro inflation rates: global-rates.com. During the 1950s and 60s, Siemens built several start-stop Hellschreiber models: T.empf.39, and the T.typ.72 & 73. The T.typ.72 sender/printer cost about 5000 DM (ref. 24) in the mid-1950s. This is equivalent to an estimated 9500 Euros in 2015, based on general consumer price index inflation statistics (ref. 23B). During the mid-1970s, used T.typ.72c machines were sold in Germany for 200-400 DM (an estimated 255-610 Euros in 2015). 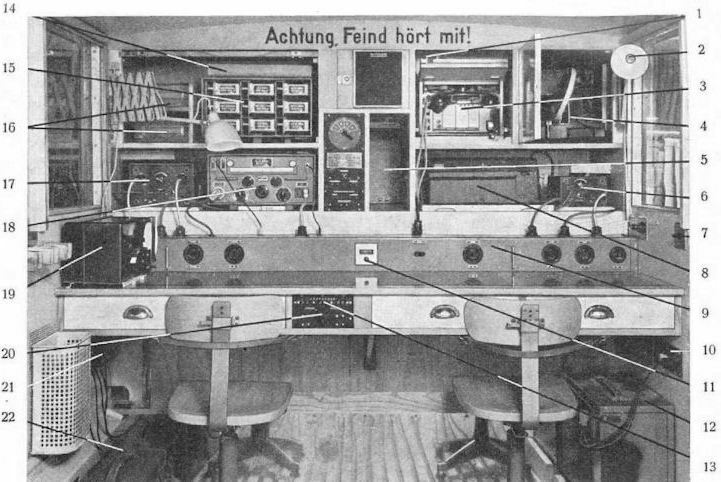 By 1938, Telefunken (a 1930 joint venture of Siemens-Halske and AEG) developed the "E 38" radio receiver for the German DNB news agency for use with their "Presse-Hell" printers. These radios were sold by DNB for 400 Reichsmark (RM) - without the vacuum tubes! The price with the tubes was 470.65 RM (ref. 26). The 1937 Siemens-Halske pricing information provided above, may be used by the reader to estimate the price in today's money. In 1947, Rudolf Hell re-established his war-torn company for telecommunications and electronic image reproduction equipment. However, now in Kiel (port city in the far north of Germany), rather than the original locations in the then Soviet-occupied part of Berlin. In the spring of 1948, the Hell company built a small batch of a new, compact printer-only model: the Hellschreiber-Empfänger 5, (HE 5). The list price was 5500 Reichsmark. In June of 1948, West Germany went through a currency reform ("Währungsreform"): the transition from the Reichsmark (RM) and the "Besatzungsmark" banknotes issued by the occupying Allied military authorities, to the Deutsche Mark (DM). The general conversion rate was 10:1, but 1:1 for company stocks, salaries, pensions, rents, and 100:6.5 for cash and savings. After the reform, the HE 5 cost 550 DM. After the first batch was sold, the color of the HE 5 was changed, and the model name changed to HE 6. The price was raised to 650 DM. Ref. 23A. These prices are equivalent to an estimated 1000 Euros and 1250 Euros respectively in 2015, based on general consumer price index inflation statistics (ref. 23B). The Hellschreiber was first introduced in 1937 on the C-Stations, then in 1939 on the B-Stations (p. 14/30 in ref. 10A, ref. 11). 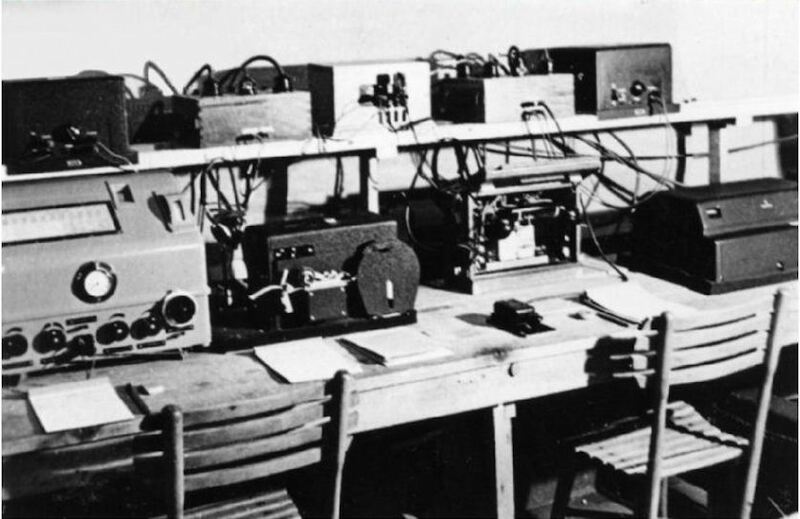 Early versions of the "Stationen" (serial numbers 1-6) comprised a T empf 12 Hell-printer, a T sum 3a tone oscillator, a T verst 16a/b/d amplifier, and a Lorenz model EO509 15 kHz - 20 MHz "Allwellenempfänger" general-coverage radio receiver (ref. 12). For stations with serial numbers 15 and above, the system comprised a T empf 14 Hell-printer, a T sum 5a tone oscillator, a T verst 18a keying device, and a 100 kHz - 60 MHz AM/CW "Allwellenempfänger" receiver type E41, made by the Zelweger company of Uster/Switzerland (ref. 13). All systems included a keyboard tape puncher ("Handlocher"), and a Hellschreiber punch tape reader/sender ("Lochstreifensender"). The following photo shows the equipment set of fixed-base station. On the top shelf (left to righ): T sum 3a tone oscillator, three signal and power switch boxes, and a T.verst.16 amplfier. On the desk top (left to right): a Lorenz EO509 radio, a T empf 12b Hellschreiber printer, an unidentified electronics box, and a T send 17c punch tape Hell sender. 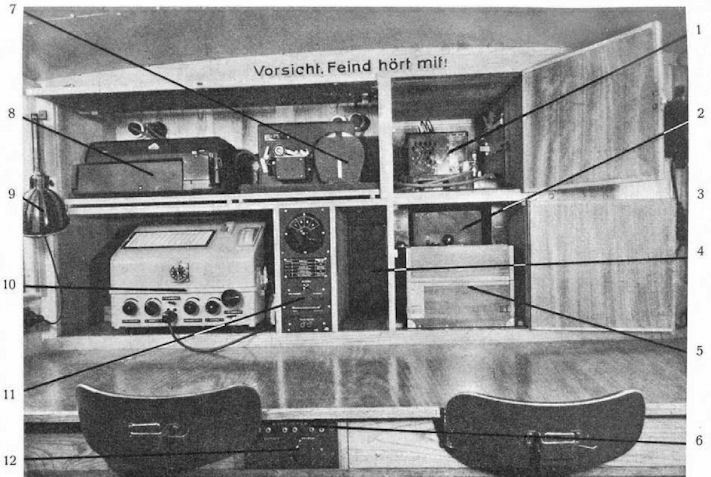 The Hellschreiber systems "Hellschreiber-Anlage HS 41" were used until 1944, when it was decided that Hellschreiber communication was not dependable enough for Swiss military operations, though it was shown that this was primarily caused by shortcomings of the Lorenz EO 509 receiver, by improper equipment operation (no operator training whatsoever, per p. 71 in ref. 11) and tedious Swiss operating procedures (pp. 15/16, note 52 on p. 30, and note 12 on p. 50 in ref. 11). In 1948, the Hellschreibers were replaced with high-speed Morse telegraphy printers (p. 16 in ref. 11). In May and June of 1941, the Japanese Vice Minister of War, Rikugun Jikan, was in Berlin to negotiate purchases of goods and manufacturing rights. On 7 June 1941, a military attaché message ("air wire / radio telegram") was sent from Tokyo by Hszry (War Office Senior Adjutant) to Rikugun. The message comprised a shopping list of Lorenz and Siemens-Halske equipment, including a Siemens-Halske Feld Fernschreiber (two, if availability permits). Ref. 19. The Swedish army bought both mobile and office Hellschreiber systems. 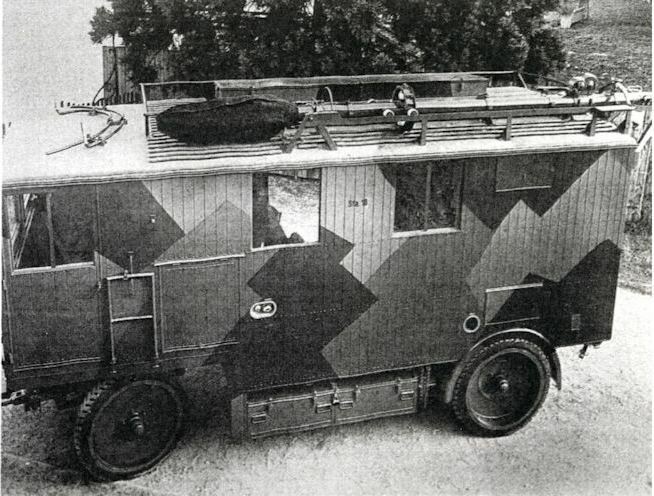 The mobile systems comprised a Hell Feldfernschreiber ("Hellskrivare för fältbruk"), two lead-acid batteries (85 Ah capacity each), and a keying device. The set was referred to as "Sats Tc 33". The set's original stock number was "Tc 90240", later "M3936-105211". The keying device had stock number stock number "Tc 20033", later "M3936-105219". Early 1941, Siemens-Halske quoted a price of 42400 Swedish Crowns (SEK) to the Swedish Air Force for eight complete Feldfernschreiber systems, similar to the systems already delivered to the Swedish Army (ref. 16). I.e., 5300 SEK per Feld-Hell set. This is equivalent to an estimated 10537 Euros at the end of 2010 (ref. 18). The 1944 book price for a complete Feld-Hell system of the Swedish Army was 6100 SEK. Ref. 18. This is estimated to be equivalent to about €12125 and US$15000 in 2010 (ref. 17). Feld-Hell systems entered service in the Swedish Army in 1942. They were used with several types of mobile stations: 75 W Tp, 250 W Bl, and the 800 W Bl. See the Feld-Hell "Performance" page. The Hell equipment was decommissioned in the early 1960s and replaced by 5-bitstart-stop teleprinters (Siemens T.typ.68, Swedish designator "Fjärrskrivmaskin M 3"). The "desktop" office systems comprised a "Handlocher" tape puncher, a "Lochstreifensender" tape reader/sender, and a "Presse Hell" printer. n 1943, a price of 10200 SEK was quoted for each office Hell system (ca. €20280 on 2010). The 1944 book price for a complete Feld-Hell system of the Swedish Army was 6100 SEK. Ref. 12D. This is estimated to be equivalent to about €12125 and US$15000 in 2010 (ref. 17). In 1943, a price of 10200 SEK was quoted for each office Hell system (ca. €20280 on 2010). The Swiss company EMA built at least four Hellschreibers models (HSG2, HS125, HPr3, and HPr4) during the late 1940s, early 1950s. Customers of EMA included the Dutch news agency ANP (Algemeen Nederlands Persbureau) and the Dutch P.T.T. Early 2015, I located archived correspondence between these three parties in the National Archives of The Netherlands in The Hague. I visited the Archives in August of 2015, and copied about 75 documents. A number of them include price quotations and invoices (ref. 22A-22N), including taxes, import duties, and shipment. I have summarized this in the table below. I have added my estimates of what the equivalent prices would be in today's money (2015), based on historic statistics on general inflation ("buying power") and exchange rates. Note that inflation for specific industrial products such as telecommunications equipment, does not necessarily track that general "consumer price index" inflation. 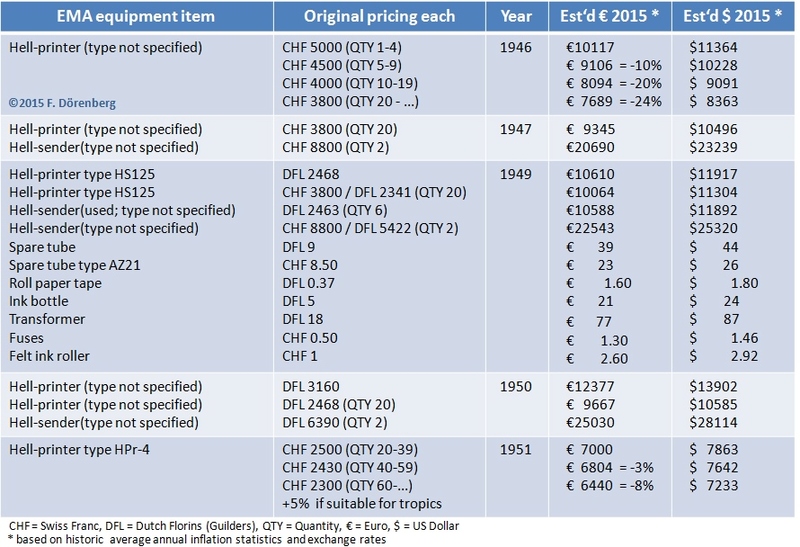 The estimated equivalent equipment prices in 2015 may seem excessive. However, when considering what the original 1946-1951 prices were, in terms of average salaries at the time, they may not be all that unrealistic... As a reference, in 1950, the average gross income in The Netherlands was DFL 3030, and an average car cost DFL 5000 (only 1 in 75 people owned a car). Ref. 21A, 21B. Source for historic DFL to Euro conversion data: Internationaal instituut voor sociale geschiedenis. Source historic Euro inflation rates: global-rates.com. To put these prices in perspective: in 1946, the average salary in the British "metalworking, engineering and shipbuilding" industry was £22.40 per month (US$98.56 in 1946), ref. 35. Based on general inflation data (ref. 36), this is equivalent to ca. £806 in 2016 (ca. €930 and US$1005). A Morse operator made about £300-400 a year in 1949 (ref. 33D). So, at the time, a Hell-printer represented several months’ salary of an average worker – as did German Hell-equipment in Germany. A "telex" teleprinter, including "adaptor" [ = 2-tone filter unit] cost £350, which is significantly more expensive than a set of Hell equipment (ref. 26A, 160A). On a regular basis, I am asked what a particular Hellschreiber equipment (or part thereof) may be worth. Clearly, the old adage holds true: "It is worth what a fool will pay for it!" But I realize that this truth is not very helpful... Obviously, the worth depends on many things: how many / how often similar items appear on the market, how popular or sought-after the item is, where the item is located (transportation cost), the state the equipment is in, etc. The latter ranges from "complete, unmodified, original, no markings removed, as-new, operational, including all official accessories" to "damaged, only suitable to be canibalized for parts". I have collected a number of prices that were paid at auction (primarily on-line such as eBay, some from auction houses such as Hermann Historica, Militärische Antiquitäten Emig, and C&T Auctioneers. Note: I do not endorse any of these auction companies. I have listed these prices (with item description) in ref. 38. Ref. 1: p. 7 in "Siemens-Hell-Schreiber", Fernmeldetechnik, Siemens & Halske A. G., Wernerwerk, Berlin-Siemensstadt, 2. 37. 5. T., SH6592, 1937, 7 pp. Ref. 4: p. 97 in "Bordfunkgeräte von Dr. Dietz & Ritter", Werner Thote, Funkgeschichte (Gesellschaft der Freude der Geschichte des Funkwesens e.V. ), Vol. 28, 2005, Nr. 161, pp. 89-97. See note 1. Ref. 6: p. 8 in "Ergebnisse der Untersuchungen über die Ford-Werke unter dem Nationalsozialismus - Zusammenfassung des Berichts". Ford Motor Company Archives. 33 pp. ; German summary of "Research findings about Ford-Werke under the Nazi regime", 2001, 120 pp. Ref. 10A: pp. 46-56, pp. 107-108, and pp. 150-154 "Die Hellschreiber Apparate", "Bedienung der Hellschreiber-Anlage", "Störungen an den Hellschreiber-Apparaten"
Ref. 14: "Hellschreiber-Anlage Modell 1941". Source: Interessengemeinschaft Übermittlung (IG UEM), Switzerland. Ref. 16: "Flygvapnets radiosystem - Del 1. 1916-1945, avsnitt 2" [air force radio systems], Arne Larsson, 13 October 2009, F13/09, 164 pp. Ref. 20A: 13-January-1948 - price quote (incl. taxes, import duties 12%) from Nederlandsche Siemens Maatschappij NV in The Hague/The Netherlands to ANP news agency in The Hague, for Siemens-Halske Tempf14 Hellschreiber printer. Ref. 20B: 27-January-1948 - price quote (incl. taxes, import duties 12%) from Nederlandsche Siemens Maatschappij NV in The Hague/The Netherlands to ANP news agency in The Hague, for Siemens-Halske Hell punch-tape sender ("Streifenschreiber") Tsend17, Hell-printers Tempf14, Hell-Feldfernschreiber (Feld-Hell) Ttyp58. Re-imports from (Siemens) Sweden. Ref. 20C: 11-February-1948 - price quote (incl. taxes, import duties 12%) from Nederlandsche Siemens Maatschappij NV in The Hague/The Netherlands to ANP news agency in The Hague, for keying-amplifier ("Tastgerät") St.verts.1, radio receiver ("Presseempfänger") model E515X, punc-tape sender ("Streifenschreiber Sender/Empfänger") model Ttyp34, remote-control unit ("Fernschaltgerät") Tbk56, and rolls of paper tape. Re-imports from (Siemens) Sweden. Ref. 20D: 4-June-1948 - internal note (in Dutch) of the ANP news agency in The Hague/The Netherlands (Mr. van de Pol to Mr. Kremer) about telecon with the board of the Dutch P.T.T. (Mr. Boersma), in which ANP assures P.T.T. that Siemens equipment is more reliable than EMA, and Siemens has no problems delivering orders or spare parts, as Siemens-Berlin is back up to 15000 employees, has re-started production of Hell-printers and Hell-senders, and is developing a communications receiver with built-in Hell-printer driver-amplifier. Pricing: Siemens-Hell-Röhrensummer (tone generator) model T sum 3a, 3b or later, Siemens-Hell-Verstärker (amplfier) model Tverst16, Siemens-Hell-Lochstreifengeber (Hell punch-tape sender) model T send 17c. Ref. 20E: 9-June-1948 - price quote (incl. taxes, import duties 20%) from Nederlandsche Siemens Maatschappij NV in The Hague/The Netherlands to ANP news agency in The Hague, for longwave telegraphy receiver Fu61a model A, and associated shortwave converters. Direct import from Germany. Ref. 20F: 21-January-1949 - price quote (incl. taxes, import duties 12%) from Nederlandsche Siemens Maatschappij NV in The Hague/The Netherlands to ANP news agency in The Hague, for hell-printers Tempf14, printer amplifier model Tverts1A (with tubes). Direct import from S-H Berlin/Germany. Ref. 20G: 22-March-1949 - price quote (incl. taxes, import duties 20%) from Nederlandsche Siemens Maatschappij NV in The Hague/The Netherlands to ANP news agency in The Hague, for longwave telegraphy receiver Funk.empf.61a, associated shortwave converter Funk.empf.62A, longwave antenna R.tr.3a/b (incl. impedance transformer, 25 m cable), felt ink rollers Tempf14T150, and rolls of paper tape T.empf.14T. Ref. 20H: 10-December-1951 - price quote (incl. taxes, import duties 12-30%) from Nederlandsche Siemens Maatschappij NV in The Hague/The Netherlands to ANP news agency in The Hague, for equipment suitable for operation in the tropics: Hell tape-printer T.empf.14, sheet-printer 9T.empf.1a, longwave receiver Fu.empf.66a, longwave receiver Fu.empf.66a with built-in Hell-printer amplifier, longwave receiver lt.empf.61a with built-in Hell-printer amplifier, stand-alone printer-amplifier St.verst.1a, new model printer amplifier (no model name). Volume discounts. Ref. 20J: 17-January-1952 - internal note (in Dutch) of the ANP news agency in The Hague/The Netherlands (from chief engineer Mr Mater to Gen Dir Mr van de Pol), with receive-station equipment prices for long wave/Europe receiver with built-in amplifier (Telefunken EPH/L/2) for Hell-printer, Siemens Hell tape-printer; lead time 2 months), for short-wave / outside Europe (Telefunken receiver E103AW/2, printer amplifier, new model Siemens-Hell amplifier (available end-1952), Siemens Hell printer Tempf14, and antenna installation fee; prices include import duties of 43% for the radios and 17% for printers and amplifiers; Telefunken receivers are suitable for the tropics. Ref. 21A: "Inkomens van natuurlijke personen 1925-1973", Table 2 in a 1979 study; title unknown, author unknown. Ref. 22C: 5-December-1947 - internal document of the ANP news agency in The Hague/The Netherlands; list of conditions to impose when ordering Hellschreiber equipment from EMA in Meilen/Switzerland. Ref. 22D: 18-May-1949 - letter (in Dutch) from the Dutch P.T.T. to the ANP news agency in The Hague/The Netherlands (Mr van der Kallen), requesting when & how the 2 Hell-printers destined for Aneta/Indonesia were paid to the P.T.T., when the 5 Hell-printers destined for ANP correspondents in Willemstad/Curacao and Paramaribo/Surinam, will be paid, and were the 13 remaining Hell-printers are, that were returned to the EMA factory. Ref. 22E: 28-October-1948 - letter (in Dutch) dated , from the accounting dept. of the Dutch P.T.T. to ANP news agency in The Hague/The Netherlands; unpaid down-payment for two Hellschreiber senders and two printers (56000 DFL). Ref. 22G: 21-February-1949 - price quote from EMA to the ANP news agency in The Hague/The Netherlands, for spare parts and supplies. Ref. 22H: 11-July-1949 - final billing (in Dutch) from the ANP news agency in The Hague/The Netherlands, to the Dutch P.T.T., per agreement of 21-April-1947. Debit: EMA Hellschreiber senders, EMA Hellschreiber printers. Credit: used EMA Hellschreiber printers. Ref. 22J: 21-November-1949 - telex message from EMA to the ANP news agency in The Hague/The Netherlands; quoting pricing for EMA Hell-printers. Ref. 22K: 22-December-1949 - billing/invoice from the Dutch P.T.T. (Head office Telegraphy, Telephony, and Radio) to ANP news agency in The Hague/The Netherlands; for EMA Hellschreibers. Ref. 22L: 5-January-1950 - final billing/invoice from the Dutch P.T.T. to the ANP news agency in The Hague/The Netherlands (Mr van der Kallen), for EMA Hell-printers and Hell-senders sold by ANP to the P.T.T., and Hell-printers sold by the P.T.T to ANP. Ref. 22M: 18-January-1950 - billing/invoice from the Dutch P.T.T. to the ANP news agency in The Hague/The Netherlands (Mr van der Kallen), for an EMA Hell-printer delivered to the Dutch newspaper "De Waarheid". Ref. 22N: 21-November-1951 - price quote from EMA to the ANP news agency in The Hague/The Netherlands, for EMA Hell-printer model HPr-4. Ref. 23B: "Inflation rate calculator, consumer price index (cpi) and price rise"
Ref. 26: "DNB-Presse-Empfänger für Telefonie und Telegrafie Type E 38", DNB product brochure, 4 pp. Ref. 28: "Durchschnittliche Bruttoverdienste für ausgewählte Orte und Gebiete in den Gewerben Schiffbau, Maschinenbau und elektrotechnische Industrie. Stand: März 1944" [March 1944 average gross wages in the ship building, mech. engineering and electrical/electronics industrie, in selected towns and areas], Section VII.2 Dokument A2 (p. 283) in "Leistung und Lohn in der nationalsozialistischen „Ordnung der Arbeit“", Tilla Siegel, Springer-Verlag, 1989, 328 pp. Ref. 30: "Dutchschnittsgehalt" and "Ein Neuwagen kostet heute umgerechnet fast 63.000 D-Mark" Sebastian Viehmann, in "Focus online", 28-Dec-2016 [pdf]; accessed 22-Feb-2017. Ref. 32: copy of item in file ref. IOR/L/I/1/1210; File 464/26B(iii) "London Press Service: installation of Hellschreiber equipment (1947-1949)" Item is in the collection of the British Library; material with UK Crown Copyright, used in accordance with the Open Government License [pdf]. Ref. 32A: Letter from S.G. Pennells to Miss M.R. Bruce (Treasury Chambers, London), dated 12th June 1948, 1 page. Ref. 33: copy of items in file ref. IOR/L/I/1/1213 File 464/26B(vi) "Hellschreiber tests (1948)". Items are in the collection of the British Library; material with UK Crown Copyright, used in accordance with the Open Government License [pdf]. Ref. 33A: First page of letter from Mr. M. Mc.Loughlin (C.O.I., London) to Mr. G.F. Crawley (C.R.O. Information Dept., London), dated 2nd February 1948, 1 page. Ref. 33B: Letter from Mr. M. Mc.Loughlin (C.O.I., London) to Mr. G.F. Crawley (CRO Information Dept., London), dated 8th March 1948, 3 pp. Ref. 33C: Letter from Mr. M. Mc.Loughlin (C.O.I., London) to Mr. G.F. Crawley (CRO Information Dept., London), dated 6th April 1948, 2 pages. Ref. 33D: "London Press Service: Transfer to Hellschreiber working – Statement by the central Office of Information", dated 23rd March 1949, 4 pp. Ref. 34: copy of item in file INF 12/419 "Hellschreiber Working Committee, technical reception arrangements (1948/49)". Item is in the collection of The National Archives; material with UK Crown Copyright, used in accordance with the Open Government License [pdf]. Ref. 34A: Letter entitled "Orders & estimated cost of Hell Equipment", from M. McLoughlin (Central Office of Information), dated 20th November 1948, 1 page. Ref. 36: sources of Pound Sterling inflation data (general cost of goods and services changes over time): thismoney.co.uk, bankofengland.co.uk, inflation.stephenmorley.org; accessed 21-March-2017. Ref. 37: "Siemens "Hellschreiber" direct writing telegraph machine", Metropolitan Police: Metropolitan Police: Office of the Commissioner: Correspondence and Papers, 1935, record 36/GEN/227 MEPO 2/3864 in the collection of The National Archives; material with UK Crown Copyright, used in accordance with the Open Government License [pdf]. Ref. 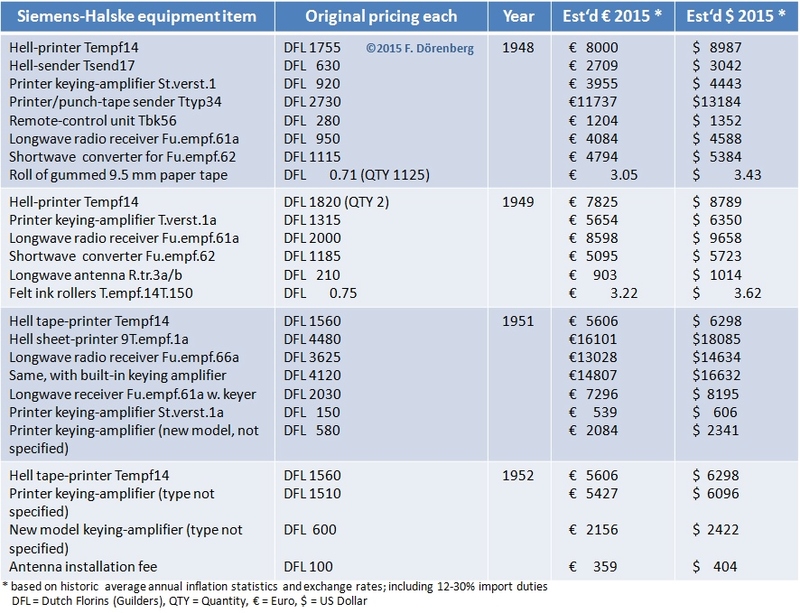 38: "Hellschreiber equipment & parts prices as fetched at auctions 2010-2019", Frank Dörenberg, last update: 19-Mar-2019, 29 pp. Ref. 39: p. 150 in "Datenblätter für Heeres-Waffen,-Fahrzeuge und -Gerät", Special Issue W 127 of "Waffen Revue", Karl R. Pawlass, 1976, ISBN 3-88088-213-4, 248 pp. Ref. 171d: 15-December-1948 - 2-page internal ANP memo of Mr. Mater to Mr. van der Pol, reporting on a visit on 14-Dec-1948 of De Arbeiderspers (AP, publishing company in Amsterdam, publisher of the newspaper "Het Vrije Volk", 1947 through the late 1960s). Includes statement that AP obtained paper tape rolls from A.E. Ruys en Co. Papier Groothandel in Amsterdam, at considerably lower cost and shorter lead times than from ANP's supplier (Neparofa in Roterdam): DFL 19.48 vs DFL 37.00 per 100 rolls. Ref. 41: pp. 27, 134, 180, 182, 206 in "Arming the Luftwaffe - The German Aviation Industry in World War II", Daniel Uziel, 2012, McFarland & Co., Inc. (publ. ), ISBN 978-0-7864-6521-7, 312 pp.